For this archival launch, I wish I could reminisce awhile but the credits are long and roll they must. Big Allis packed small and played big. Thinking back over how I got there in 1989 to start a magazine with Jessica, and here now at J2, throws me back to my twenty-something undergraduate-self in headphones in the UCSD Archive for New Poetry in San Diego, where in the early 1980’s, I lurked for months at a time in my DIY residency listening to the Paul Blackburn tape collection and more. Sometimes I miss the days of wine and photocopies, of audiotape and roses, the memorabilia of high acid content. Buried at sea in an acoustic ocean. You can take the girl out of the archive but you can’t take the archive out of the girl. In the mid-1980’s I found myself in NYC working at Scientific American Books, first in editorial and later in the art department on the 37th floor, on hard science textbooks like the 1,187 page Molecular Cell Biology. Coincidentally poet Peter Seaton worked in Marketing on the 35th Floor. Sometimes we would take the elevator down together. About this time I considered pursuing graduate study in film and applying to the University of Pennsylvania doctorate program (would they let me combine 20th- Century American Literature, Film, Poetry and Poetics?). I decided against it as I had recently completed an MFA in Combined Media at Hunter College and had been bored to tears. Instead I stayed put and conducted my own writing experiments producing work that would lead to my first book, Civil Noir. I continued working at Scientific American, going to the movies, and started Big Allis magazine with Jessica Grim. Once again, Jessica got the show on the road by matching her lens of clarity and realism with my Sirk-esque “edited on the wind” visions swooshing up a marbleized mirrored elevator. Jessica thinks big and beautifully, with calm, marvelous efficiency and technical elegance. She’s Bacall to my Bogart. Most issues of Big Allis contained a thank you to Jean Foos and I thank her again for her independent eye, fierce consistency and personal generosity. A happy consequence of Big Allis was the beginning of a friendship with Jean. The project was also catalyst for adventures coast to coast with Jessica well worth the telling another time. Despite many changes in our lives, my friendships both with Jessica and with Jean have continued. The last two issues of the magazine came about in great part to the no-holds-barred commitment of co-editor Deirdre Kovac. With rebellious intelligence she contributed superb editorial and design work. As a guest editor, Fiona Templeton envisioned and produced the fine “14 from Great Britain & Ireland” feature for the eighth issue. With the quirky charm of a user’s manual for the poet’s poet: how-to welcome newcomers and old hands. Peripheral editing is a perishable process. Expand the flow of new voices on an avenue of innovative practice. Improvisatory and curious, is the editor, the good reader, the good writer. We asked around for recommendations of people to ask for work. We directly and repeatedly solicited people whose work we felt was exciting and important to have in an issue. The Future Issue is ever only dark from outside. Leap into it on the run and lightness is built in. The issue always ends. Saved by the bell from an unhappy ending. So until this Reissues launch got underway, I thought I was through with zines, that it was Big Allis or ‘no one’. But recently I got that old feeling and I decided, why not? I should announce my availability to guest edit or serve as a contributing editor. So there it is. Book me. Finally, what a pleasure to dedicate my part in this archival launch to three essential supporters of mine: my two sons Roman and Martial, and my brother, John Neilson of Oakland—all keen poetry fans. It sings it through the tire. And the auto tires in motion are still on the line. It was 1989 and Mel and I decided a magazine focusing on innovative writing by (primarily) women was sorely needed. However was publishing great work, but we felt there wasn’t a space for a lot of the women we knew about who were writing fabulous stuff, both in the U.S. and Canada… We wanted something charged with a presentness and vision around the importance of innovative and formally “experimental” women’s writing, a space in part for writing by women who were early in their writing careers, hadn’t yet had books, perhaps, or a lot of exposure. At the time I lived up in Inwood, so most of the working meetings for the mag happened at Mel’s on Thompson St. I was working at NYPL in midtown, and would walk down to Mel’s after my workday. So it’s late one evening, early on – and we’re having the name conversation. Lots of possibilities, nothing quite sticking. The idea came up of place names as a field to mine, and I said “I have a big atlas at home” – Mel said “what?” and I repeated, “yeah, I have a big atlas at home” – we were both tired, I was thinking I needed to get to the subway…Mel said “I thought you said “big Alice!” I don’t think we knew at that moment about the power plant in Queens – nick-named Big Allis after Allis Chalmers Corp., the Midwest-based manufacturer of industrial machinery – but all that came together quickly (Big Alice wasn’t quite right, whereas somehow Big Allis was perfection). The first four issues had a small image of the factory on the last page. Turns out when leaving NYPL every day, heading down the steps onto 5th Ave, I could catch a glimpse of Big Allis itself, straight down 41st Street, in the distance. Mel did her terrain-scanning magic and came up with the fabulous work of Jean Foos, who, happily for us, agreed to come on board for Big Allis cover design. The first issue was laid out and pasted up by Mel and me in her apt. So much hot wax, grid lines, tiny numbers. By the time #2 came out I had moved back to SF, and 2 yrs later to Ohio. Feeling distant, and pulled in too many directions, I stepped away from the editing in 1996 and the last two issues of the magazine were co-edited by Mel and Deirdre Kovac. Looking through the issues of Big Allis again, after all this time, I’m struck by a lot of things. First, what a lot of great work, there; and how lucky we were that folks wanted to be a part of what we were doing. Then: we thought we knew what we were doing but the kinetics of it kind of barreled along on the energy and time we had “back then” – but really? The project – Big Allis – always out just ahead of the thinking I’d say, does, in fact, hold. I feel happy and proud about that. Melanie and Jessica visited me at my art studio at 32 Union Square East and invited me to design a logo and cover for their new magazine. I was totally thrilled­ – as a painter, I was already intrigued by the painter-poet connection. I had never heard of any of the writers and was happy to be part of their experiment/adventure. For the first two issues I used bold black and white photos by Hope Sandrow. She had shown her work at Gracie Mansion Gallery in the East Village and was kind enough to let me go through piles of her grainy prints until I found the right details to wrap around the covers. One was a portrait of artist Keiko Bonk and the other simply showed windblown hair. For the tires cover, I saw a tiny image in a catalog from Anthology Film Archives and they were able to send me an 8x10 glossy print of the film still. My mother sent me a polaroid photo of the new greenhouse that our dad built for her – and it made a rather striking cover. My sister, Alyssa, who had recently moved to Portland, Oregon and knew nothing of my work on Big Allis recognized the greenhouse on the shelf of her local bookstore. She picked it up to see that indeed it was our very own back yard. OMG! — over 2 decades since the 1st Big Allis fireworks, our reading reimagined & shaken up (not shaken down, or recruited). A cornucopia of new experimental poetry, Jean Foos’s spooky cover wrapping the anti-tranquilizer with its 3-D semantics – a rematerializing, multitorquing, postpatriarchal language-centered rebellion. So much starts to seem ‘former’: post-representation, post-narrative, post-sentimentalism of identity. We all “try to be uninfluenced by gender expectation” (Sally Silvers). Frontal sensation with abrupt pingpong whiplash. A treasury of little bits, rhythmic zigzag & consonantal crunch. “How many dioramas? Can I be in them all?” asks co-editor Jessica Grim. Or Hannah Weiner’s “Drop signs on wrong”. Take off your headphones. Poststutter undone alone, like Fiona Templeton’s theater audience of one. Affect tollbooth: post-coherent, depths all on the surface, crazy huddles of co-editor Melanie Neilson’s “sorted intricacies”: “all bang”. A nonstop transitive upending stereotypes. Unsolipsistic, the words get you lost. Don’t stop eating this chocolate. It is understandable if you confuse the poetry magazine Big Allis with the power plant by the same name in Queens, New York. Both are maintained by vast networks of energy. In the case of the magazine Big Allis, the grid is composed of numerous women celebrating the diversity of what it is to be a woman writer. On a grid, no mode of discourse can be self-contained and thus definitive. With Big Allis, the notion that “women’s poetry” is a confessional matrix defined by Sylvia Plath’s and Anne Sexton’s valorizations of suicide is laid to rest. Instead, Plath and Sexton are but two points on a complex mesh of feeders and fanouts. More than any other magazine, Big Allis has created a high voltage corridor upon which women can rely for connection to an interoperable world. Thank you, Big Allis. The poetry desert. This is how I experienced the poetry landscape of my generation in the late 1980s/early 90s. Poets of my ilk found themselves sandwiched between the dynamic conversation of L=A=N=G=U=A=G=E writing on one end, and the first seedlings of radical appropriation on the other. Don’t get me wrong… the desert can be a beautiful place. It has cacti, crimson hedgehogs, mesquite trees, mice, snakes, hawks, and post-lang, pre-web literary journals like Big Allis. Big Allis was at the literary center of the 1990’s NYC experimental poetry world of the Segue Foundation and the Ear Inn readings. The journal had a clear vision to publish primarily women authors who were committed to progressive and innovative writing. The younger poets that the editors assembled started to present a concrete picture of future possibilities. Some of these poets included: Jeff Derksen, Andrea Hollowell, Stacy Doris, Bill Fuller, Steven Farmer, Kim Rosenfield, Andrew Levy, Rodrigo Toscano, Judith Goldman, and many others. This moment of the desert poetry landscape was brief but fertile. Big Allis played a major role in both recording and constructing a pivotal moment in American poetry that has long been under-documented. Big Allis was not the first of the women-edited literary journals of the period, but it was key in the development of our thinking about relationships between gender and genre, physiology and language. As “Big Allis,” it was a massive machine of agricultural production; as “Big Alice” (a sonic alternative that was obviously embedded in the journal’s name), monstrous magnanimous femininity offered its (scary) embrace. I remember being proud to be published under the journal’s auspices – Allised and allied with a group or writers, not necessarily all female but all engaged with a poetics of large-scale invention. 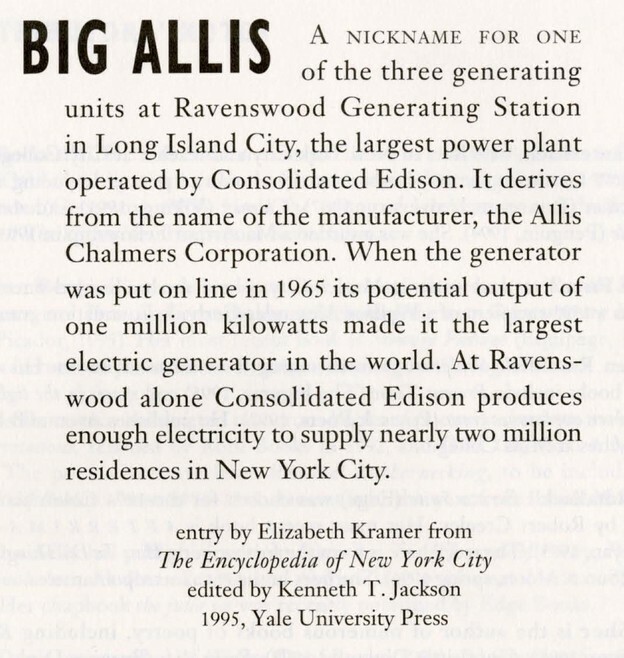 Big Allis was a supergenerator that I was lucky enough to meet in New York in the late 80s. I wasn’t aware of its 1000 megawatt turbine (Wikipedia had yet to be born) but I knew it was helmed by two poetic engineers of generous and raucous intellect. For eleven years it kept the lights on, publishing works that changed my world. I’m happy to say that contrary to news reports, Big Allis did not conk out – it was just cooling in wait for this electric reboot. Big Allis. We loved her from the outset. We awaited each appearance with excitement. We were happy that Grim and Neilson had brought her into being as one of the best ongoing selections of contemporary American writing during a decade of major poetic experimentation. B.A. was always consequential; it was always fun. How wonderful that it is available now to new readers. In the 1990s, a handful of literary publications stand out as seminal leaders. Many suffer from partisan sclerosis. Big Allis, on the other hand, focused on innovative women writers but not to the exclusion of men. Big Allis focused on language writing but included many other groups of adventurous writers. Meticulously edited by Melanie Neilsen and Jessica Grim, reading Big Allis allows us to breathe fresh air. Each issue shaped a unique poetics and extended the nine issue run; I remember looking forward to every issue and hoping they would publish a work of mine. Releasing a digital version of the full set of Big Allis gives the reader a broad perspective on a key decade in American poetry. Big Allis, i.e. New York. I associate Big Allis with a particular heyday – the terrific milieu around the Ear Inn reading series of the late ‘80s & early ‘90s. There was this gang of us not-old-enough-to-be-language-poets working those low Manhattan poetic streets with a new style and flair, a boom and bust cycle all our own – Big Allis lifted us out of the gutter and planted us squarely next to the gutter, and did not ask us to apologize, or go back to the gutter, though we often did. We were: Lee Ann Brown, Kevin Davies, Stacy Doris, Rob Fitterman, Liz Fodaski, Judith Goldman, Deirdre Kovac, Andrew Levy, Bill Luoma, Sianne Ngai, Kim Rosenfield, Juliana Spahr, Rodrigo Toscano, Melanie and Jessica of course, & certainly many others I’m not thinking of at the moment. In any case, it was a small scene that seemed large. Hell, it became large – and Big Allis was a very large part of that effect. & affect. We rocked, and added another brick to the universal barricade.